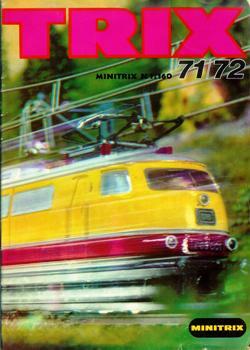 The biggest news of of the 1971 / 1972 Minitrix catalog was that Trix had been purchased by Mangold, but it was more than that. 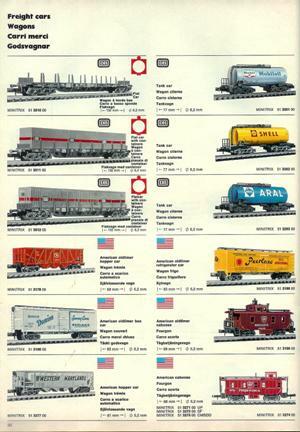 By the time this catalog had reached print, N-Scale had just completed an explosive expansion from simply being very small trains manufactured by Arnold and by Lone Star to becoming a very popular scale. 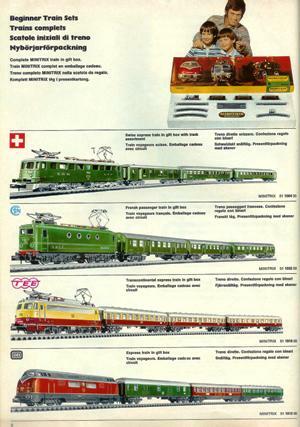 Likewise, the term “N-Scale” was now widely accepted, marking the beginning of a new spurt of growth for both the model railroad hobby and for Minitrix. 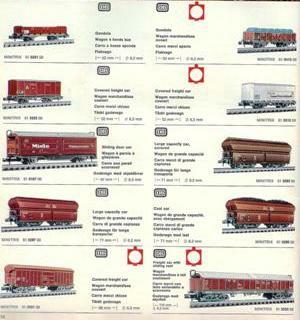 The Minitrix 1971 / 1972 catalog was also an exposition of the range of the Minitrix product line. Because of the purchase by Mangold, it must have been felt by the new owners that it was necessary to establish a solid market position. 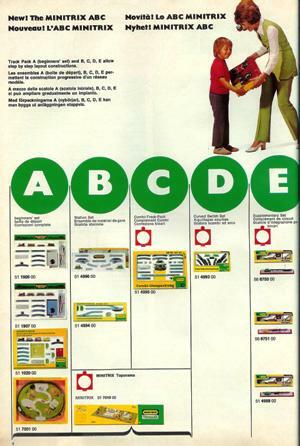 The 1971 / 1972 catalog was proof of that. 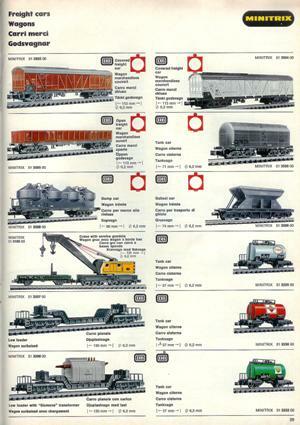 As mentioned in the accompanying page, the 1971 / 1972 catalog was an expensive one. 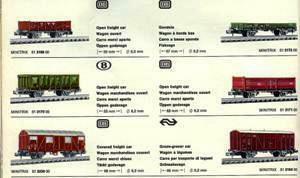 It also marked the introduction of the track set to N-Scale. 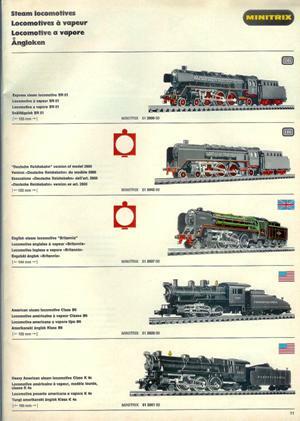 The Arnold and Minitrix catalogs for this period both show a range of these extension sets, while the Flesichmann catalog shows simply an N-Scale expansion set along with layouts built using the set along with extra track. The concept is to first purchase the starter set (“A”) and then add additional expansion sets to create a larger layout. 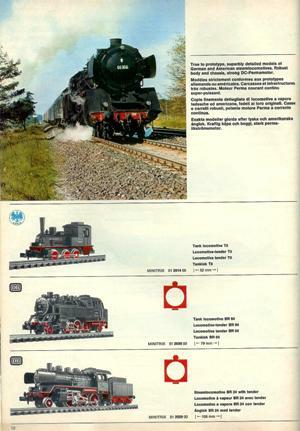 The expansion set is not commonly found in the North American market, but both European and Japanese manufacturers still market these sets. 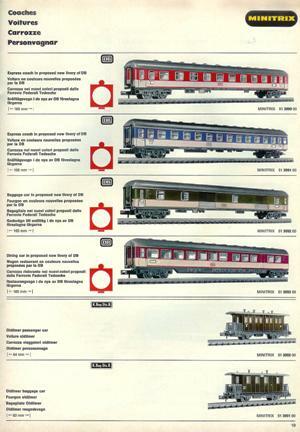 The Minitrix starter sets were largely repeats of earlier sets in the 1968 catalog, but in greater number. 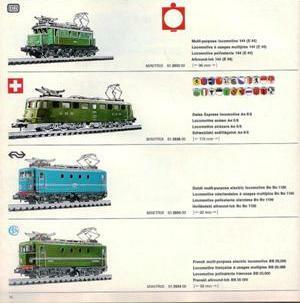 In all cases, these sets used existing tooling. 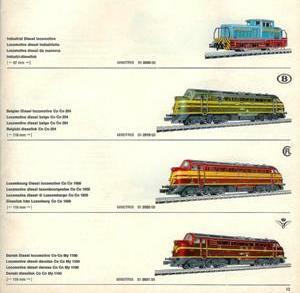 There were four new steam locomotives in the Minitrix line for 1972. 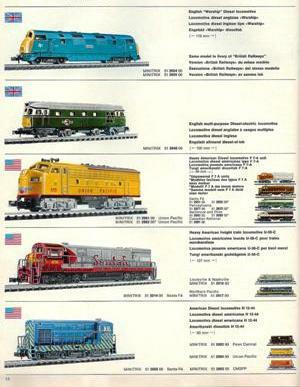 Both British and American diesels were also shown. 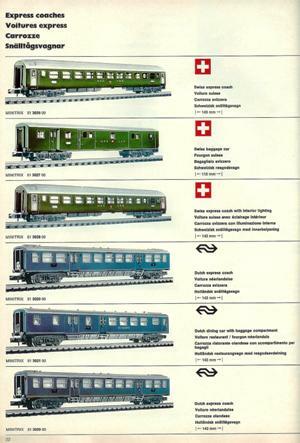 The rail buses were the same. 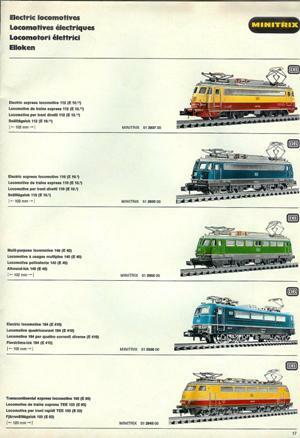 There was one new electric locomotive, an E44. 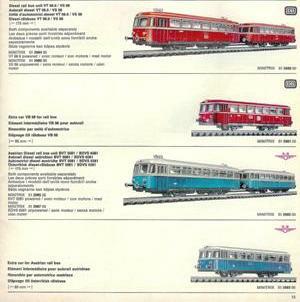 There were four new passenger cars in the Minitrix 1972 catalog. These four are significant since they measured 165 mm in length, making them “scale” length. 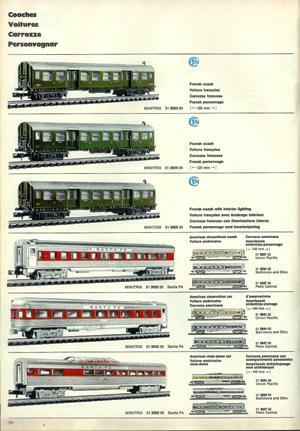 Earlier Minitrix mainline intercity passenger cars had first been 136 mm (about 68” in length). 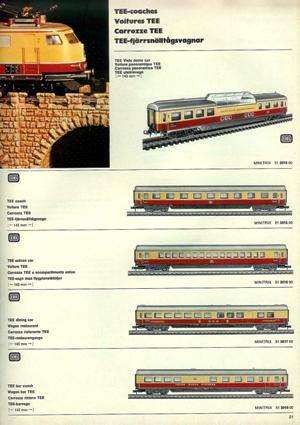 The TEE cars were 143 mm ( about 72’ in length). All these earlier cars remained in the product line. 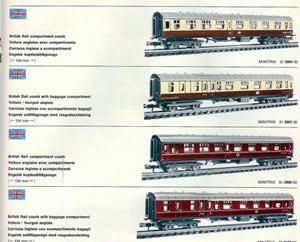 The two English passenger cars were there, too, in two liveries. French and North American cars. 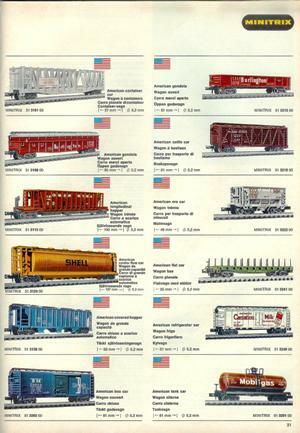 The American cars listed were in four liveries for United States railroads; notably absent were the two Canadian liveries shown in an earlier catalog. 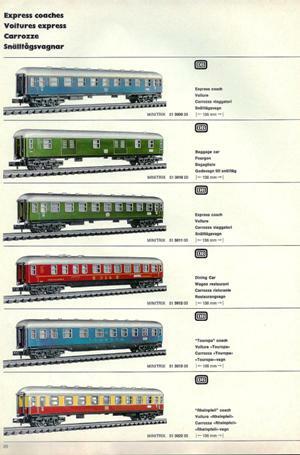 There were thirteen new cars, several of which shared a common underframe. The balance of the Minitrix line (track, signals, transformers and such) were largely the same as earlier years. 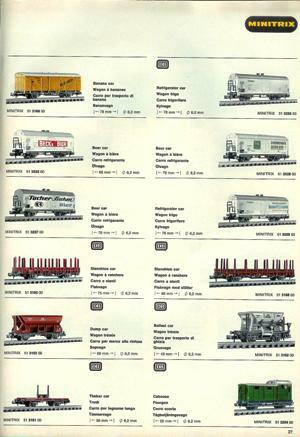 In all, however, the Minitrix 1971 / 1972 catalog was quite impressive and a clear display that Mangold intended to be a market presence.